In addition, undergraduate students pay $1.75 per credit for the Health & Dental Plan. 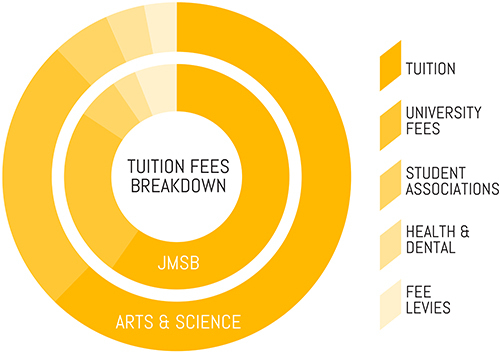 All fees above are used for the general operations of the CSU and the services that it manages. The use of the various funds is limited to the service they are collected for (i.e. the Clubs fee levy may only be used for Clubs activities, HOJO fees may only be used for HOJO, etc). Because of this, the CSU doesn’t just have one budget — it has six to plan and manage. See our Resources page to access Budget and Audit documents. What are the CSU budgets? Operations: This is the largest of the CSU budgets. It funds the day-to-day operations of the CSU and most of its initiatives. These vary a lot, and vary from year to year as student priorities change. Some examples of the operations budget include Orientation Week, staff salaries, office expenses, student life events, campaigns for student rights, sustainability initiatives, the CSU Farmers Market, the Hive Free Lunch at Loyola campus, student bursaries, and more. Clubs: The Clubs fee is used to support the activities of the many diverse student groups registered under the CSU umbrella. The Clubs department organizes the annual Clubs Fairs and Gala, funds some renovations and furniture for Clubs spaces, and distributes annual budgets to the various Clubs. The department is overseen by the Internal Affairs Coordinator and the Clubs & Space Committee, as well as by one staff member who provides administrative support to CSU student groups. Student Space, Accessible Education, and Legal Contingency Fund (SSAELC): The SSAELC Fund is a large fund which can be used for specific projects set out in the CSU bylaws such as carrying out studies, retaining professional services and contractors, constructing/acquiring/renovating student spaces, and satisfying a legal action taken against the union. The fund is invested in stock holdings, of which the interest and dividends may be used to fund student initiatives and support Concordia student associations that vote for a strike mandate. A portion of the dividends are used to fund the Community Action Fund, which gives funding grants to external and student projects. The SSAELC fund is worth approximately $10 million as of late 2018. Off-Campus Housing & Job Bank (HOJO): HOJO is a CSU service located on the 2nd floor of the Hall building. It offers resources and legal information relating to housing and workers’ rights, a classifieds website for housing and jobs, and workshops for the community. Advocacy Centre: The Advocacy Centre is committed to the promotion and preservation of undergraduate students’ rights at Concordia University. Advocates can help students who find themselves in difficult situations by accurately identifying their needs and determining and executing the necessary course of action. The Centre can also act as a commissioner of oaths. Legal Information Clinic: At the Legal Information Clinic, volunteer law students provide Concordia students with free legal information about a wide variety of issues. There are a number of other per-credit fee levies collected by a variety of groups, such as Queer Concordia, The People’s Potato, the Centre for Gender Advocacy, The Link, The Concordian, and more. Fee levy groups are not under the management or oversight of the CSU; their budgets and internal processes are determined independently of the Concordia Student Union and Concordia University, though their fees are approved and modified by students in referendums organized by the CSU. All undergraduate students are members of these fee levy groups and are eligible to participate in their activities. The CSU annual budget(s) are approved by Council every year in June. Budgets are a statement of an organization’s priorities. This year’s budget prioritized reducing expenditures in order to balance the operations budget, while protecting services for students and ensuring that campaigns for student rights, the union’s raison d’être, are well-funded. To achieve this, modest savings were found in a number of budget lines, and Executive bonuses were cancelled. For this fiscal year (2018-19), the CSU is introducing a new step in the budget process: Budget Revisions. This is a mid-mandate review of the CSU’s budget plan, to see what, if any, financial plans need to be altered to better reflect the CSU’s needs and realities. This new budget is expected to be presented to CSU Council for approval in January. By doing the revision process, the CSU will have a better chance to consult students while they’re more likely to be on campus, resulting in a budget more reflective of student priorities. The revised Budget for the 2018-2019 fiscal year is available for download here. To ensure the highest standards of transparency, the CSU’s finances are externally audited every year. The most recent audit for fiscal year 2017-18 was approved by CSU Council on November 14, 2018. The CSU’s daily expenses are available to all members upon request at the CSU’s main office on the SGW campus (H-711). Members can also meet with the Finance Coordinator in person if they wish to discuss CSU finances. Do you have questions, ideas, or feedback regarding the budget and its accessibility? Feel free to reach out! You can email the CSU Finance Coordinator at finance@csu.qc.ca.